Recently I discovered a really cool website called Easy Canvas Prints. This site allows you to upload any picture of your liking and have it made into a decorative canvas print to hang in your home! It was seriously one of the easy photo buying experiences in my lifetime! It is one of my favorites! Besides the fact that they look incredibly cute, they also don't look as though they are in misery being that close to one another. Photos like that are hard to come by these days. Hahaha﻿. Then, using the tools on Easy Canvas Prints, I selected a canvas size, the type of wrap, uploaded my photo, and followed the step-by-step instructions for personalizing my order. My favorite photo of my children is now decoratively hanging on a once empty wall in my bedroom. In addition to putting a smile on my face every time I see it, it has me wondering which of my other favorite photographs I should have done next!! Do you have a favorite photo you'd like to see made into a canvas print? Courtesy of the amazing people at Easy Canvas Prints, one lucky Only Parent Chronicles ready will win an 8x10 canvas print with a .75" standard wrap! To win: This giveaway is open to residents of the continental Unites States only. If your email address is not visible in your profile, you must leave it in your comments. To be eligible, you must publicly follow Only Parent Chronicles via Google Friend Connect. Winner must reply within 48 hours of notification or a new winner will be selected. Giveaway will be open from 9:00 am July 18, 2011 through 5:00 pm July 25, 2011. Mandatory entry: "Like" EasyCanvasPrints on Facebook. 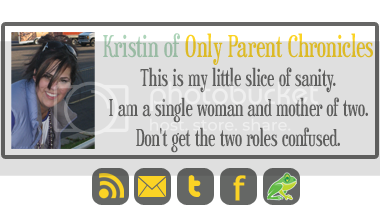 ~ Start a discussion in the Only Parent Chronicles Blog Frog Community. ~ Contribute to an existing discussion in the Only Parent Chronicles Blog Frog Community. I received one canvas print free of charge for review purposes. I was not otherwise compensated for this post, and all opinions are mine. I like ecp on fb. Like Easy Canvas Prints FB as kyhere here. 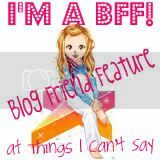 Following Kristin_OPC twitter as ky2here1. I like Easy Canvas Print on Facebook user Lisa Garner. I'm following Kristin_OPC on Twitter @lisalmg. I'm a member of your Blog Frog community as Lisa. I liked Easy canvas prints on FB and I am a GFC follower!